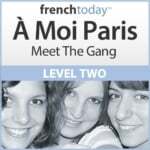 Learn the pronunciation of the stations located on the Paris subway line number seven: “La Courneuve – 8 Mai 1945 – Villejuif – Louis Aragon” + tips on how to ride French subway cars with multiple destinations. 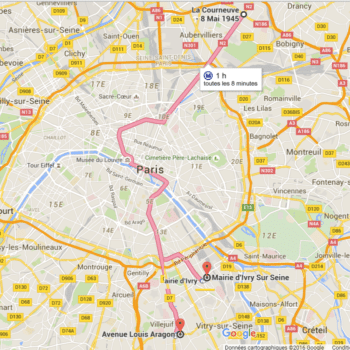 What should you do if you take the wrong direction on the Paris métro? Don’t panic, it’s an easy fix! The line number seven of the Paris subway system is among the longest, with 38 stops. The line separates into two different directions after the “Maison Blanche” station, one direction going towards “Mairie d’Ivry”, the other one going towards “Villejuif”. So, if you are going to a station located on either one of these directions, you have to make sure you are aboard the right train. The info is located on the side of the train, and also inside the train. If in doubt, just ask one of your fellow passengers: “ce train va bien à Mairie d’Ivry / Villejuif ?” – now that you have access to the right pronunciation of the station, this shouldn’t be a problem! If you are going to a station on the Mairie d’Ivry line, and are in the wrong train, just get off at any station up to Maison Blanche, stay on the platform and wait for the next train: it should be going to the other direction (make sure you check!). If you realise you are in a train going to the wrong direction after Maison Blanche, you will need to back-track to Maison Blanche (follow the direction “La Courneuve”) and then board the right train. The Paris métro stations are announced by a loud speaker, and there are also maps on the walls where you can check your itinerary. Some are electric and you will see the next stations lit-up. It’s always a good idea to check with the map that you are actually going in the right direction! If you are on a line which has several destinations, such as line number 7, the loud speaker will also announce the direction of that specific train. It will do so at the last station before the fork. If you are not going to right direction, don’t panic! Just get off at the next stop, and follow the sign showing the first station name of the direction you need to go to. No need to buy a new métro ticket, you can change direction, and make multiple connections with the same ticket. Your ticket is valid until you exit the subway doors.